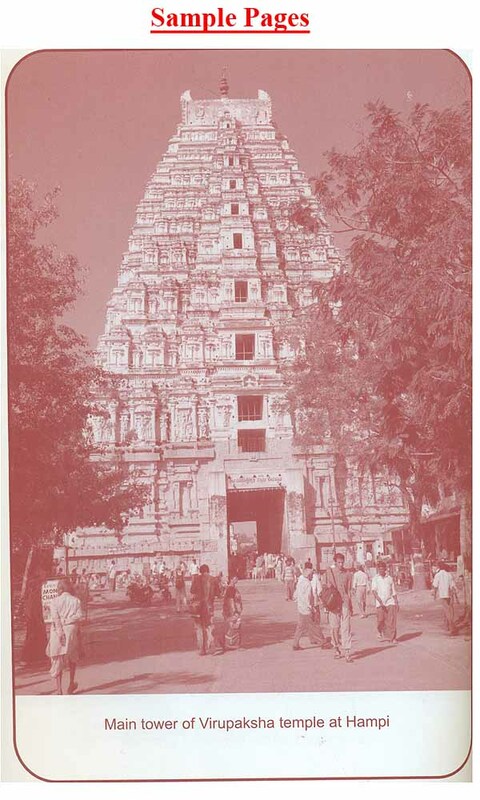 Dr. K. G. Gopala Krishna Rao has been engaged in research into the times of Vijayanagara Empire, especially of the Tuluva era, since more than a decade. Although a practising doctor after an M.B.B.S., degree from Mysore University of Vijayanagara. His dedication to the subject and a sharp academic mind show up admirably in the dozens of his research articles in various journals and the volumes of inscriptions relating to madhawa mathas he has edited. Bharatiya Vidya Bhavan has produced several books on history by different authors, but among these Dr. R.C. Majumdar's History series is indeed the gem of the crown. Our Bhavan's Gandhi Centre of Science and Human Values is proud in bringing out this book on the most popular king of the southern India, Sri Krishna Deva Raya of Tuluva dynasty. Our Karnataka Govt. has declared and is celebrating this year as the 5th Centenary Year of Sri Krishnadevaraya's coronation. Dr. K.G. 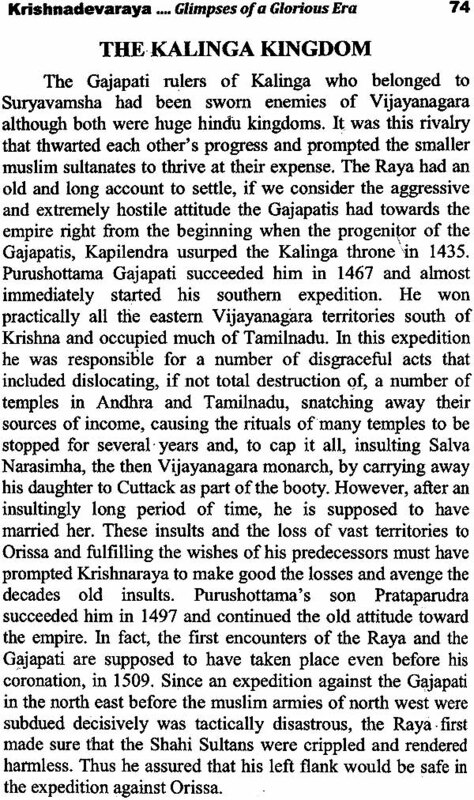 Gopala Krishna Rao, a medical doctor by profession and an historian as a passion has articulated the brief history of "Sri Krishnadevaraya - Monarch of Vijayanagara - Glimpses of a Glorious Era" in a very lucid style, right from the Prologue to the End . Much information about his reign comes from the accounts of Portuguese travellers Domingo Paes and Fernao Nuniz. 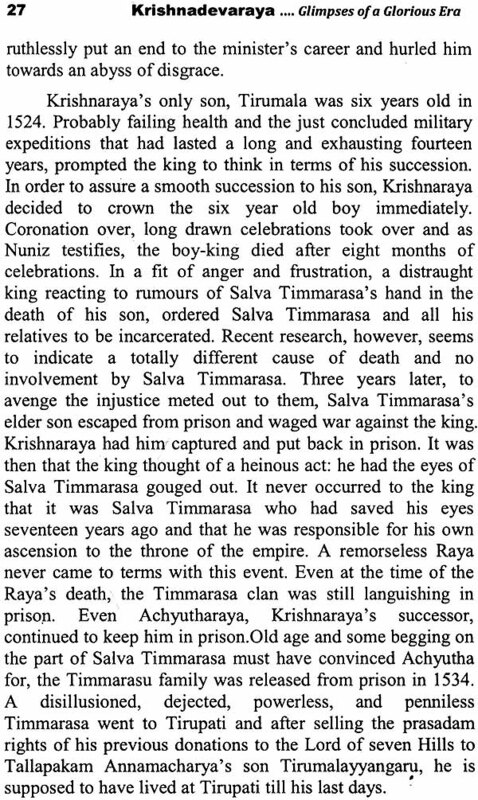 Krishna Raya benefited from his able Prime minister Timmarasa who was regarded by the king as Appaji (father figure) and was responsible for his coronation. 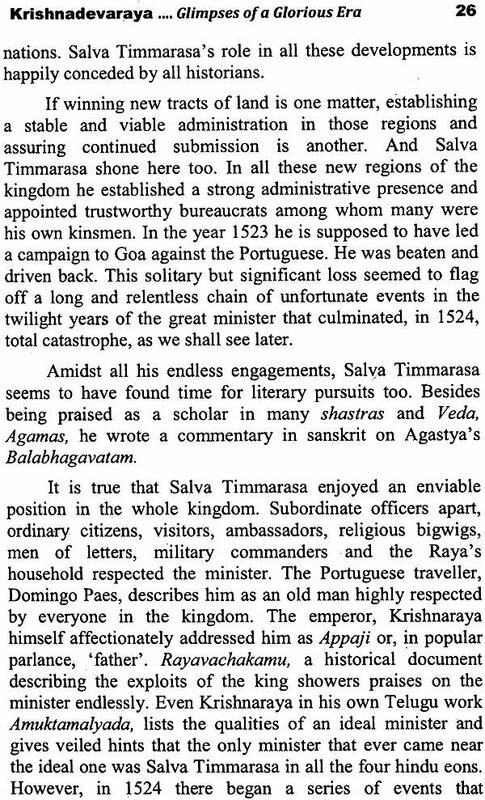 [The travelogues indicate that the king was fluent in many languages including his mother tongue Tulu]. He was not only an able administrator, but also an excellent general, leading from the front in battle and even attending to the wounded. Mr. Paes describes Vijayanagar as "the best provided city in the world" with a population of not less than half a million, and also praises Krishna Raya as "The most feared and perfect king... a great ruler and a man of much justice". Though a follower of Sri Vaishnavism and disciple of Lord Venkataramana of Tirumala, he showed respect to all sects. Petty religious prejudices never influenced him either in granting gifts or in his choice of companions and officers. According to the supposed first Portuguese visitor Barbosa, "The King allows such freedom that every man may come and go, live according to his own creed, without suffering any annoyance". The official languages of the court were Kannada and Telugu. Krishna Raya's rule was an age of prolific literature in many languages. Common populace as also the intellectual elite remember emperor Krishna Deva Raya with reverence even to this day. For them, he lives in the 'Rayagopuras' or temple spires - that welcome devotees in dozens of sacred towns of South India to this day - and in the irrigation channels commissioned by him called 'Rayakaluve'. This title by Dr. Gopala Krishna Rao is quite authoritative and bound to inspire the readers. I thank the author for obliging us with his valuable write-up and wish the book all success. The last century saw one of the most fruitful of efforts in constructing the history of this medieval empire that had enchanted countless foreign visitors, historians and common men alike. Defining and writing, history of Vijayanagara engaged the attention of a whole generation of honest and sincere historians - both Indian and foreign. With dedicated research and concerted effort new facts are constantly being added to the already immense mass of information that has been obtained in the past hundred years or so. It is the duty of historians to keep the general public abreast of the developments in the field of Vijayanagara research. This general responsibility apart, there is another more pressing reason for the Gandhi centre of science and human values to bring out this work of glimpses at this juncture: the celebration of 500th anniversary of Krishnaraya's coronation on January 24th, 2010. Krishnadevaraya is one of the most remembered of all the monarchs that ruled South India in the past. And for good reasons. For one thing, he was a great unifier of the people of South India. At the height of his rule he held the regions of Andhra, Karnataka, and Tamilnadu, parts of Kerala and Goa, and commanded tributes from parts of Srilanka. It is this linguistic, ethnic and religious mosaic cherished and nourished by a sense of unity, that is worth emulating in these troubled times. The general absence of any sense of regional affiliations among his generals, who came from all the three linguistic regions, must have been highly satisfying to the emperor whose tightrope-walk was plainly visible. Relegating his Kannada origin to the background, he gave more liberally to the temples of Tamilnadu and Andhra than to temples of Karnataka. And in the literary field, he erred on the other side: while his court had eight renowned Telugu poets, there was only one Kannada poet of any standing. The ordinary people remember him to this day. For them, he lives in the 'Rayagopuras' or temple spires that welcome devotees in dozens of sacred towns of South India to this day . Or in the 'Rayakaluve' or irrigation channels commissioned by him and his officers. Or the hundreds of tanks that were built in his regime and faithfully store and distribute water to this day. Indeed, it is gratifying to see that people do remember and celebrate the most important event in his life- his coronation. All through the preparation of this book, I have diligently borne in mind that the book is meant for the general reader who has a right to be left alone from controversies and drab academic discussions. I have also scrupulously avoided confusing the reader with too many opinions. Only when such opinions are intriguing, entertaining or just plain fascinating, have I hazarded such inclusions. I have tried to make this as readable as a story although facts back all the statements made here. 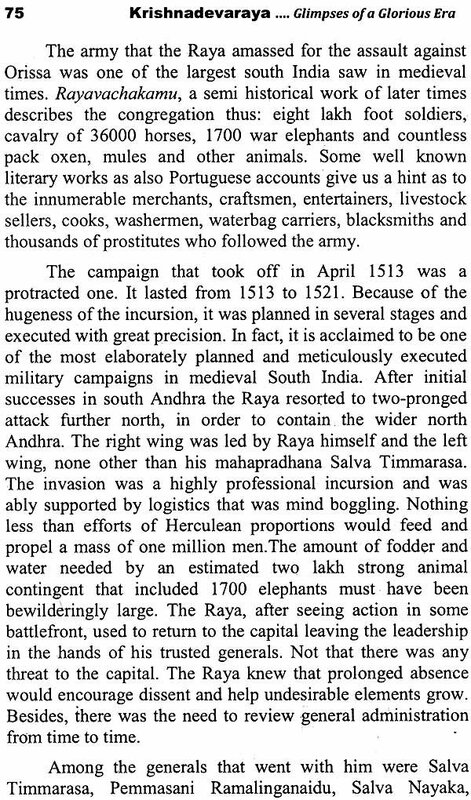 The present work is a modest and restrained outcome of my study of the history of Vijayanagara for more than a decade. A more detailed and scholar oriented work on Krishna Raya is under preparation and will be published soon. In preparing this manuscript I have drawn inspiration from historians including Dr. Suryanatha Kamath, Dr. Vasundhara Filliozat, Prof. Dixit, Dr. Nelaturi Venkataramanayya and many others. My grateful thanks are due to Prof. M.V.Srinivas, Prof. M.G. Manjunath, Dr. M.G. Nagaraj, and Dr. Kuruva Basavaraj, Srinivas Sisla, Shatavadhani Dr. R. Ganesh and many others for their help. Photo credits are gratefully due to Or. L.N. Swamy, Or. Paramashiva Murthy and Dr. M.G. Manjunath and T.T.D., Tirupati.